You are here: Home » Operating System » How to install flash player in Centos / Redhat. How to install flash player in Centos / Redhat. This post can also answer the question ” how to fix the firefox error on centos/redhat linux”Installing the flash player on centos/redhat linux seems to be very difficult sometimes. But the installation is quite simple 🙂 . 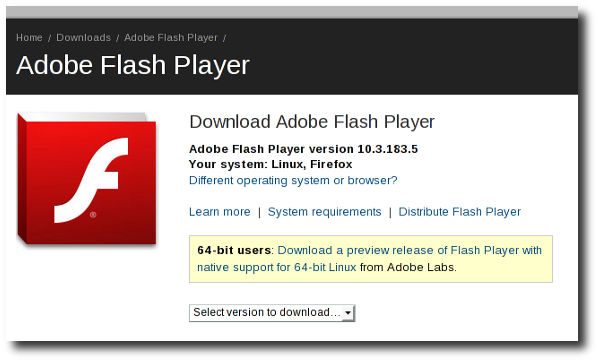 The flash player may not be installed automatically using firefox. While trying install firefox, you may get the error following error ” Firefox could not install this item because “install-0zr..rdf” (provided by the item) is not well-formed or does not exist. Please contact the author about this problem.”The Screeshot of error is provided. To fix this issue, you need to upgrade/install certain libraries using yum. I have mentioned the commands below.1. First you need to install those libraries (.i386 and .x86_64):yum install curl compat-libstdc++-33 glibc nspluginwrapper2. Once done with the libraries, we need to download the flash player rpm.mkdir flashcd flashdownload the rpm inside the folder flash.click here to Download3. Next we need to execute the command below to install the rpm. This command should be executed inside the folder, where the rpm is downloaded. Ours is in the folder ‘flash’.rpm -ivh flash-plugin-10.0.12.36-release.i386.rpm(replace with the version of rpm you have downloaded)4. Close the Firefox and restart it. You should be able to see the flashes hereafter. To fix this issue, you need to upgrade/install certain libraries using yum. I have mentioned the commands below. Once done with the libraries, we need to download the flash player rpm. download the rpm inside the folder flash. Next we need to execute the command below to install the rpm. This command should be executed inside the folder, where the rpm is downloaded. Ours is in the folder ‘flash’. Close the Firefox and restart it. You should be able to see the flashes hereafter. HOW TO REARRANGE AND CREATE MULTIPLE COPIES OF THE MAIN MENU! Speed Up your Torrent Downloads !! !